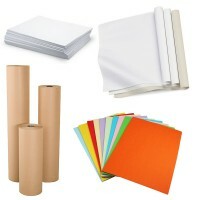 Paper Products- Campbell International Specialist Tapes. This popular general purpose packaging material is lightweight and is ideal for protecting goods in transit.Lightweight and economical, designed to reduce initial packaging and shipping costsRaised corrugated flutes on one side to provide protective padding and cushion from impactManufactured from r.. Size: 20" x 30" (508mm x 762mm), Quantity: 12.5Kg Pack, approx. 650 sheets.Thickness: 52.8gsmUnprinted white newsprint paperFavoured by fish and chip shops - food safeGood for wrapping crockery and glasswareScrunch to create effective void fillFood safe, general use wrappingThis multi-purpose p..